Leaving our home town of Darwin in Northern Australia, we headed south on the Stuart Highway. The green landscape around us gradually became more arid as the kilometres ticked by. We spent our first night at the Daly Waters campground. The next day we had been driving for a few hours when Stephen spotted a beautiful white flower, so we decided to stop for lunch and investigate. As we got closer we realised it was a Convolvulus vine creeping over a tree. If I had met this flower a few months earlier, I would have walked right on by without connecting. I’m an independent person, and the idea of a plant that climbs over and suffocates other plants has never appealed to me. Thankfully, my friend Kathleen had recently softened my view on vines by introducing me to a vine essence she made. Connecting deeply with Kathleen’s vine essence helped me understand that vine spirit medicine helps to balance us if we are too independent or not independent enough. It also helps us to let go when we are struggling with grief. With this experience fresh in my mind, I stopped and connected with the white Convolvulus flower and instantly found myself standing in front of a glowing ladder of light leading into the sky. Ground yourself, said the flower spirit. I imagined being a tree, and sent my energy roots into the earth before stepping up onto the first rung of the ladder. As I climbed, my mind was flooded with pure, simple, creative ideas. This flower spirit inspires us, filling our mind with shafts of light from heaven and the ‘higher masters of light’, often referred to as angels, saints and ascended masters. Weeks later, I reconnected with Convolvulus, this time using the photograph I had taken. I imagined stepping into the photograph and standing in front of the flower. A glowing white unicorn appeared and speared me through my third eye. Foreheads locked together we gazed into each other’s eyes. The unicorn said Become one with me. Let me take you to the upper realms. I agreed, and was transformed into a single hair on the unicorn’s head. I could feel him running and then I saw a flash of light. Suddenly I was ‘vomiting’, purging toxins and lower frequencies. My feet tingled and a voice said You are part of the great spiral of life. I am so grateful I connected with Convolvulus. An initiation flower of the finest quality, Convolvulus was my doorway into spiritual pilgrimage. Meeting this flower put me on notice that this was no ordinary journey I had embarked upon. This was a wildflower spirit journey through Central Australia – a healing journey. 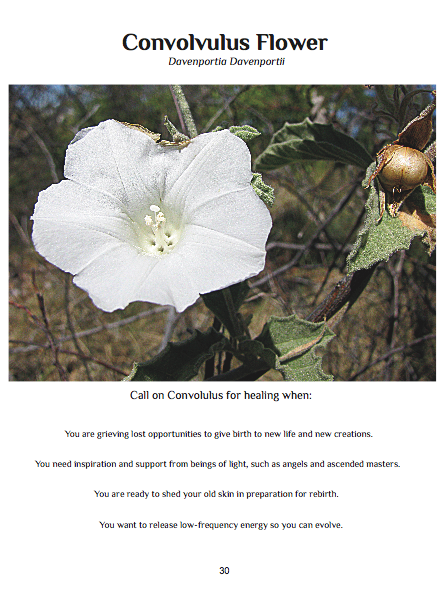 In the months following our wildflower journey, Convolvulus helped me shed my old skin in preparation for rebirth, ushering in a new phase of personal growth that is still unfolding in my life today. The first time I met Convolvulus, it showed me a stabbing pain in my womb. When I listened to this pain I realised I had been grieving lost opportunities to give birth to new life and new creations. Convolvulus was a balm for this grief, promising new inspiration, revelation and hope. A few months after connecting with Convolvulus, I enrolled in a workshop called ‘Birth into Being’. I rarely attend workshops but I felt strangely drawn to this one, probably because I was struggling with the editing of this book and searching for any excuse to avoid it! After telling us about the sacred flowing spiral of life, the facilitator helped us remove blockages and birth trauma, so we could free our creative energy and reach our higher potentials. Then we rebirthed ourselves. Afterwards, with my passion for writing renewed, I realised what a perfect vehicle this workshop was for the spirit medicine of Convolvulus. Convolvulus often comes into the healing room to help me when I’m working with clients (male and female), who are grieving after miscarriage. And it’s an excellent healer for physical and psychic wounds to the womb, a storage site for female intuition. If you would like a copy of this book, please help me raise funds for publishing by supporting my crowd-funding campaign.